1. “Interstellar” Should Be Seen on Film. 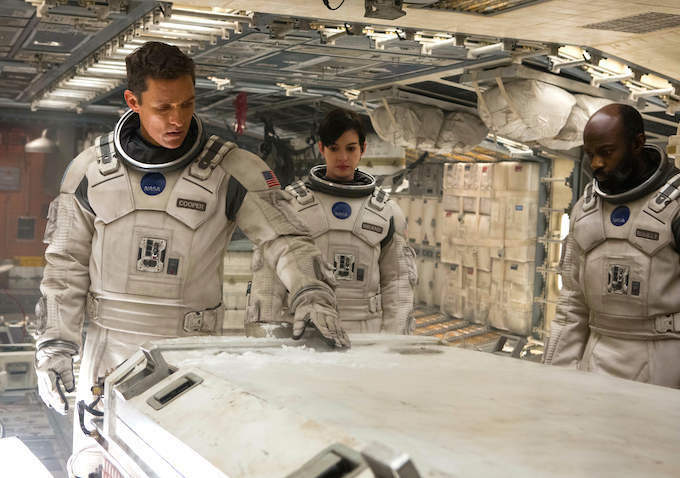 “Interstellar” hits most theaters late tonight, but it’s already playing in theaters equipped to play film. Is it worth seeing in the format Christopher Nolan choose to shoot it on. Matt Singer of ScreenCrush says yes. Like the planet Earth of “Interstellar,” analog filmmaking and projection is doomed; if it doesn’t go completely extinct in our lifetime, our children’s children will only experience it the way we experience oil lamps or black and white televisions—as ancient, vaguely ludicrous museum pieces. Projected film’s end, like the movie’s Earth’s end, is inevitable. From very early in “Interstellar” it is made clear that nothing can be done to save the planet. But this is how you rage against that dying light: By releasing your movie on an antiquated format and letting theaters who still operate that format show your movie before those that don’t. Read more. 2. What Do We Want from Endings? The new podcast “Serial” plays like a great crime series not unlike “Fargo” or “True Detective,” but it might make a lot of people angry by not ending the way it’s expected because the true story it’s based on doesn’t have answers. We’re not great at accepting endings with open questions, and NPR’s Linda Holmes tried to understand why. But the very nature of this — serial — encourages you to see its similarities to familiar narrative forms of storytelling that would be expected to end in a way that was intentional and structured, where there is an authorial control over events. And while the uncertainties of the underlying story don’t mean that the episodes and the series aren’t structured (just the opposite, really), they’re not structured in the way people wanted the end of “Lost” or “True Detective” or “Fargo” to be structured. There is a chance, a good chance, every chance, that this story is going to end in frustration and discomfort, maybe in near equipoise, and it will be nonsensical to blame for that writers who didn’t know what they were doing. Read more. 3. Give Reese a Chance. After years of making questionable choices, Reese Witherspoon is finally returning to making interesting choices again with films like “Wild,” “Inherent Vice” and the much better than it looks “The Good Lie.” Yet her comeback isn’t being received as a comeback, and Wesley Morris of Grantland writes about how that needs to change. Witherspoon might be more interested in dark places than in black holes. Still, there was something about the video of her soused altercation with that police officer (“You’re not a real cop!” she screamed) that made you want to see some other side of Witherspoon, the side that surfaces in “Mud” and in her human exasperation in everything from “Election” to “Sweet Home Alabama.” Next month brings a movie of Cheryl Strayed’s memoir, “Wild,” in which Witherspoon plays a divorcée on a long, salubrious hike, and a good, smallish part in Paul Thomas Anderson’s “Inherent Vice.” The excellence of the latter film exponentially exceeds the former, but Witherspoon is wonderful in both. Re-teaming with her “Funny Face”/”Charade” director Stanley Donen, Hepburn embraces every challenge in Frederic Raphael’s clever, sophisticated script, which asks her to play a carefree youth, a giddy newlywed, and a snippy middle-aged wife and mother…What’s so great about Hepburn’s approach is that there are always glimmers of the young Joanna when she’s bickering with Mark in the later scenes, and indications even early in the romance that these two aren’t going to be blissfully happy forever. Read more. 5. Essential Indie Romcoms. Is the romantic comedy dead? Many believe so, but Jesse David Fox of Vulture argues that it really just went underground. Fox picks 27 great indie romcoms that are more “When Harry Met Sally” than “The Ugly Truth,” all worth seeking out. Like “Greenberg,” “In a World …” is a romantic comedy by way of a hero’s journey. Though the movie is about Lake Bell trying to make it in the male-dominated field of voice-over artists, there is a cute, awkward courtship between her and Demetri Martin. Bell also directed the film and wrote the super-funny script that won her the Best Screenplay honor at the 2013 Sundance Film Festival. Read more.